Smartclip, the multiscreen video and brand advertising platform, has published the findings of its research on Connected TV users that found with every new purchase of a television set the penetration of smart TV devices increases. 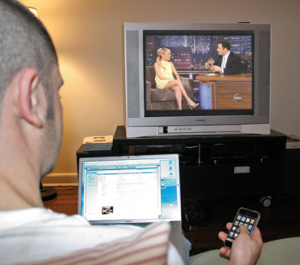 – Nearly two-thirds of respondents use the Internet frequently whilst watching television. – 6 per cent of respondents are always online whilst watching television. – Internet-based use of multiscreen viewing is most important according to the respondents of the study, exceeding TV viewing in terms of the length of time used. – More than half the respondents (56 per cent) already own the devices necessary to use the internet via a TV screen, whether directly via smart TV devices, or via a Connected TV device such as a Blu-ray player or a gaming console connected to the TV set. – It is now becoming widely acceptable for new content to be targeted to individual sets via Connected TV, at a time when consumers are connected. – The online content used on the television screen, in addition to YouTube and Facebook, consists for the most part of weather, gaming, music and news apps, which are used by nearly one in three at least once a week, taking time away from traditional TV viewing. The time spent engaging with the television screen appears to be changing, with many more opportunities for interaction. User interest in the capabilities of Connected TV is extremely high. For the consumer, connected TV signifies above all a greater freedom of choice. – Non-linear viewing of series and films leads the rankings with interest from 84 per cent of viewers. – Traditional TV content remains relevant but being able to view the content at a time that suits the viewer is a major advantage of Connected TV. – Niche interest programmes that are no longer shown on linear TV play an important role in Connected TV for 66.5 per cent of respondents. – There is also scope for additional genres, in particular games, sports and fitness courses, which proved to be popular amongst respondents. – Connected TV is becoming the control centre of the living room. Consumers have more control, deciding when they want to view content delivered to a familiar home environment. – Consumers use the interface for research, to chat with friends about a series, or to view their photos. – It is easy to access personal content, call up videos, shop online or chat over Skype. This viewing behaviour is backed up by the study where 69 per cent of the respondents see themselves setting up their own “TV homepage” in the future.